One of the Iron Crafters, Tawny Bee, did this great siamese twin embroidery for our Iron Craft Halloween challenge and it reminded me of a party I threw years ago for the release of the Smashing Pumpkins’ Siamese Dream album (another lifetime ago). 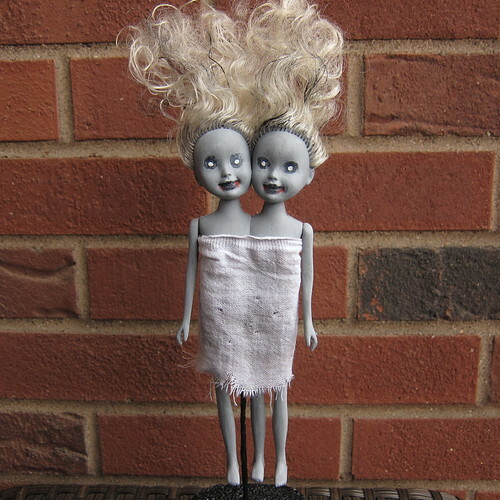 We created centerpieces for the party by turning baby dolls into siamese twins. 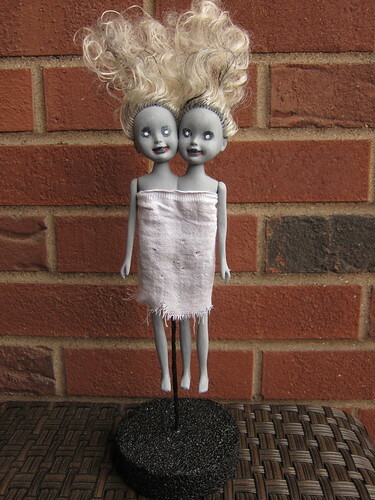 That memory got me thinking what a cool addition siamese twin dolls would make to my Halloween mantle, especially if they were zombie siamese twins! So, the next thing you know I am off to the dollar store looking for small plastic dolls. Look at these sweet, little fairies. Ok, they are kinda creepy, but let’s make them even creepier! 1. 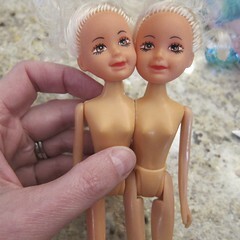 You want your siamese twins to have two arms and three legs, so remove the right arm from one doll and the leg arm from the other. Remove the leg from one doll on the same side as the arm. 2. 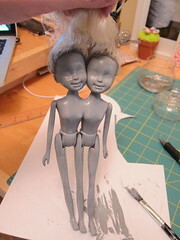 Using the knife and file, remove parts of the dolls bodies until the fit together at the shoulders. You want them to be pretty flush, so it seems like they are sharing one body. 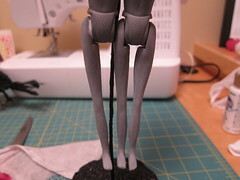 You may need to file down a little at the legs too depending on your doll. This part will be hidden in her dress, so just make sure they fit nicely together. 3. 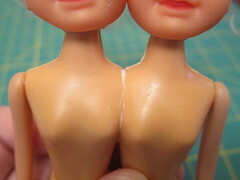 Super glue the dolls together at the shoulder (and hip if needed). Let dry. I then filled in any gaps at the should with tacky glue to give it a more seamless look once it is painted. 4. Paint your dolls – I mixed up a grey and painted all of the doll (including the scalp because it showed through their thin hair). Once that was dry I added black circles for the eyes and painted the lips black. I finished the faces by adding white eyeballs and toning the black down with watered-down white. Finally, I added some red around the mouth. You can really play with the painting to get whatever effect you want. I added streaks of black and grey paint to the hair as well. 5. 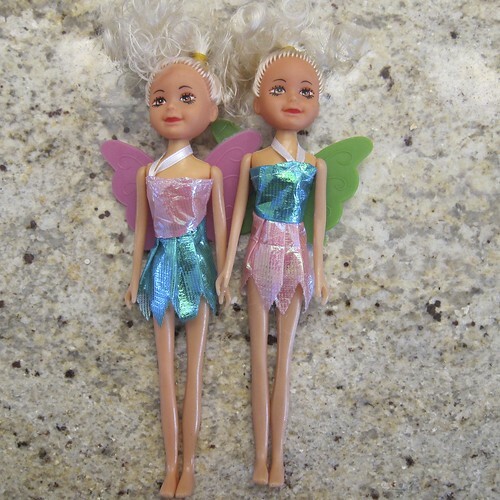 Make the dress – The dress is just a rag around the dolls body. 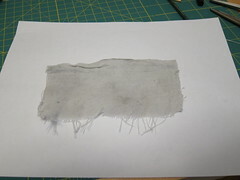 I tore a rectangle the right size from a tea towel and frayed the edge. Then I put it in some watered down grey paint for color. 6. 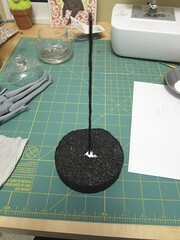 Make the stand – Paint the styrofoam disc and floral stem black. Let dry. Using the styrofoam glue, glue the stem into the middle of the disc. Cut the stem to the right length for your dolls to be mounted on it. 7. Glue the dolls to the stand at the back. Let dry. 8. Glue on the dress at the top, covering the stand. 9. Style the dolls hair. Mine stood up on its own with just a little rubbing between my hands. Use hairspray if needed to get the effect you want. Also check out our tutorial from last year on how to make a Zombie Baby Head. 6 years ago by Kat in Craft Projects , Crafts , Halloween , Holiday , Projects | You can follow any responses to this entry through the RSS feed. You can leave a response, or trackback from your own site. Those twins are very creepy! love Love LOVE!!! 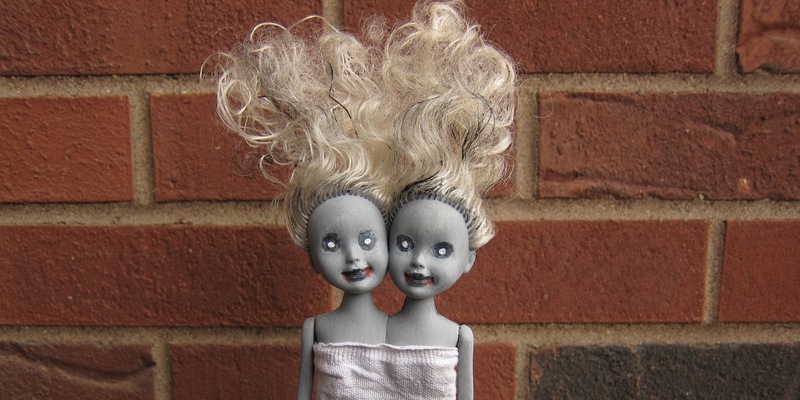 There’s just something really creepy about twins, and zombie twins are even creepier. I love these little girls so much! I hope I get a chance to make them for Halloween. What a fantastic idea and thank you for sharing. 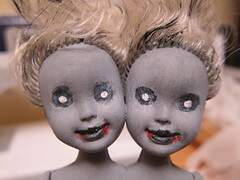 I got everything today to make these zombie Siamese dolls:) except the dolls:( I couldn’t find them anywherehelp!!! Oh gosh, I found my dolls at a dollar store. They usually have something in the toy department that is a Barbie type knock off. You probably won’t find these exact dolls as this was from 3 years ago, but really any fashion type doll will work. I tried to make this today. Got the dolls from dollar store. The super clue won’t glue them together. And the acrylic paint didn’t turned out like yours. 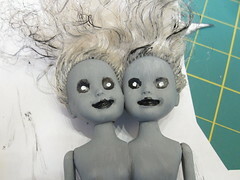 The dark grey paint was clear on the dolls. The black paint is like clear and grey in certain areas. Doesn’t turn out complete one grey color like yours. So disappointed. Was hoping to make these for my Halloween party. Oh, that is too bad. It is hard to know why it didn’t work for you. 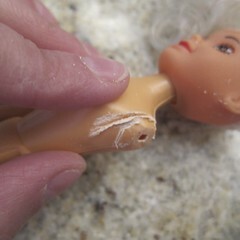 My best guess since the glue and paint didn’t work is that the dolls were made of a different type of plastic.